Bundle up fresh blondie bars in warm coats of white and dark chocolate as a sweet way to wish friends a Merry Christmas. 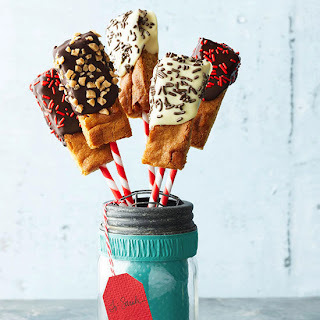 Bedazzle them in nuts, toffee, and sprinkles, then stick them on red-and-white sticks for a cute lollipop look. Preheat oven to 350 degrees F. Line a 13x9x2-inch baking pan with foil, extending foil over the ends of the pan. Grease foil; set pan aside. In a small bowl combine flour, baking powder, and salt; set aside. In a large mixing bowl combine brown sugar, butter, and vanilla. Beat with an electric mixer on medium to high speed until combined. Add eggs, one at a time, beating well after each addition. Gradually beat in flour mixture. Stir in marshmallows. * Spread dough evenly in the prepared pan. Bake about 30 minutes or until top is golden and edges are firm. Cool on a wire rack. Use the foil to lift uncut brownies out of the pan. Invert onto a cutting board; remove foil. Trim edges of uncut brownies to make a 12x8-inch rectangle. Cut rectangle into thirty-two 3x1-inch sticks. Cover and freeze about 30 minutes or until firm. Insert a lollipop stick or skewer into an end of each brownie stick and place on a waxed paper-lined baking sheet. Place cashews in a small shallow bowl. In a small saucepan heat and stir chocolate pieces over low heat until melted and smooth. Dip half of each brownie stick into melted chocolate, allowing excess chocolate to drip back into saucepan. Immediately sprinkle with cashews. Place on prepared baking sheet. Let stand about 1 hour or until set. 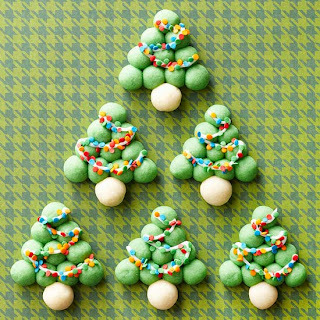 Roll and pack homemade dough into snowball-like cookie trees. String them with sweet vanilla icing, then add fun pops of color using decorative candies for lights. In a large bowl beat butter with an electric mixer on medium to high speed for 30 seconds. Add sugar. Beat until combined, scraping sides of bowl occasionally. Beat in milk and vanilla until combined. Beat in as much of the flour as you can with the mixer. Using a wooden spoon, stir in any remaining flour. Remove 1/2 cup of the dough. Tint the remaining dough with green food coloring. 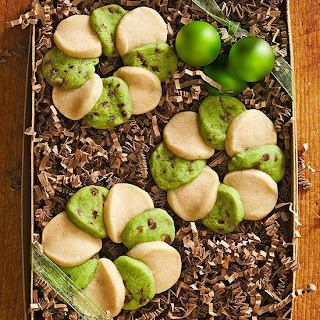 Preheat oven to 325 degrees F. For each cookie, use the green dough to shape ten 1/2-inch balls. On an ungreased cookie sheet, arrange balls in a row of four, topped by a row of three, then two, then one on top. As you arrange the balls, gently press them into each other. Use the plain dough to make a 3/4-inch ball and place it at the bottom of the tree for a trunk. Repeat with the remaining dough, leaving 2 inches between cookies on cookie sheet. Bake for 10 to 12 minutes or until edges are light brown. Cool on cookie sheet for 2 minutes. Carefully transfer cookies to a wire rack; let cool. Drizzle Powdered Sugar Icing back and forth over cookies to look like strings for lights. Add decorative candies to icing for lights. Let stand until icing sets. In a medium bowl stir together powdered sugar, vanilla, and enough milk (3 to 4 tablespoons) to make drizzling consistency. 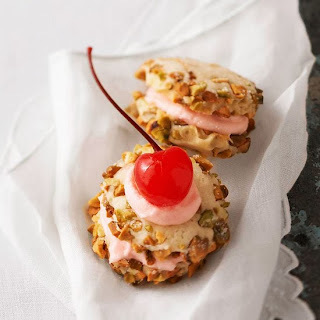 These pretty Christmas cookies offer a creamy cherry-flavor mixture, crushed pistachio nuts, and a maraschino cherry on top. In a large bowl, combine the 3/4 cup butter and the 3/4 cup powdered sugar. Beat with an electric mixer on medium speed until well mixed, scraping side of bowl occasionally. Add egg; beat until combined. Gradually beat in flour and salt on low speed until well mixed. Cover and chill about 1 hour or until dough is easy to handle. Preheat oven to 350 degrees F. Place pistachio nuts in a small bowl. Shape dough into 1/2-inch balls. Roll each ball in pistachio nuts to coat. Place balls 1 inch apart on an ungreased cookie sheet. Dip the bottom of a glass in granulated sugar and flatten each cookie. Bake in preheated oven for 8 to 9 minutes or just until edges begin to turn golden brown. Transfer to a wire rack; let cool. While cookies are cooling, prepare filling:: In a small bowl, combine the 1-1/4 cups powdered sugar, the 1/4 cup butter, and the vanilla. Beat in enough of the maraschino cherry juice to make a filling of desired consistency. Reserve about 1/4 of the filling for decorating cookies. Spread about 1 teaspoon of the remaining filling on the bottom of each of half of the cookies. Top with remaining cookies, flat sides down, pressing lightly together. Before serving, spoon a small amount of the reserved filling on top of each assembled sandwich cookie. If desired, press a maraschino cherry into filling. Makes about 21 sandwich cookies. With layers of raspberry preserves, white chocolate, and mascarpone, these decadent holiday cookie sandwiches are irresistible. Preheat oven to 375 degrees F. Line a cookie sheet with parchment paper; set aside. In a large bowl, beat butter with an electric mixer on medium to high speed for 30 seconds. Add sugar, baking soda, and salt. Beat until combined, scraping bowl occasionally. Beat in egg and vanilla until combined. Alternately add flour and buttermilk, beating on low speed after each addition just until mixture is combined. Spoon dough with a teaspoon, 1 inch apart onto prepared cookie sheet. Bake in the preheated oven for 7 to 8 minutes or until tops are set. Cool completely on parchment-lined cookie sheet on a wire rack. Peel cooled cookies off the paper. 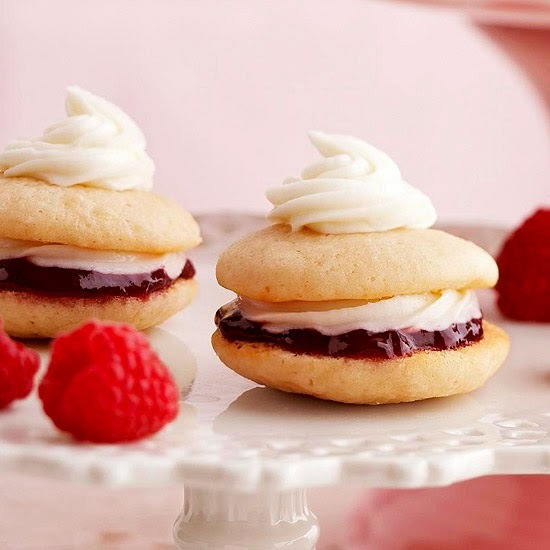 Spread the flat side of half of the cookies with about 1/4 teaspoon raspberry preserves. In a large pastry bag fitted with a small star tip, pipe White Chocolate and Mascarpone Filling over the raspberry preserve layer. Top with the remaining cookies, flat sides down. If desired, pipe additional filling on top of whoopie pies and/or sprinkle with colored sugar. Chill for 30 minutes before serving. Makes about 72 sandwich cookies. In a heavy small saucepan, combine white baking chocolate (with cocoa butter) and whipping cream. Cook and stir over low heat until chocolate nearly melts. Remove from heat; stir until smooth. Cool for 15 minutes. Meanwhile, in a large bowl, combine mascarpone cheese and butter. Beat with an electric mixer on medium to high speed until smooth. Beat in vanilla. Gradually add powdered sugar, beating well. Beat in the cooled white chocolate mixture. Chill about 30 minutes or until firm enough to pipe. Share some holiday cheer by sending snazzy wreaths to your friends' and family's front doors. In our Christmas cookie version, we alternate vanilla and peppermint-chocolate doughs for a minty-sweet treat. In a medium mixing bowl beat butter with an electric mixer on medium to high speed for 30 seconds. Add sugar and salt. Beat until combined, scraping sides of bowl occasionally. Beat in as much of the flour as you can with the mixer. Stir in any remaining flour. Divide the dough in half. Add the 1/3 cup miniature semisweet chocolate pieces, mint extract, and a few drops green food coloring to one dough portion; stir until combined. Add the vanilla to the remaining dough portion; stir until combined. Divide each portion in half. Shape each dough half into an 8-inch roll. Wrap rolls in plastic wrap. Chill rolls about 2 hours or until very firm. Preheat oven to 375 degrees F. Line cookie sheets with parchment paper. Using a serrated knife, cut dough rolls crosswise into 1/4-inch-thick slices. For each wreath, alternate four slices of green dough and four slices white dough to form a circle, slightly overlapping slices. Leave a 1-inch circle in the middle. Space cookies 2 inches apart on the prepared cookie sheets. Bake for 10 to 12 minutes or until edges are firm but not brown. Cool on cookie sheet for 5 minutes. Transfer to a wire rack and let cool. If desired, in a small saucepan heat and stir semisweet chocolate pieces and shortening over low heat until melted and smooth. Transfer chocolate to a small resealable plastic bag. Snip off a small corner of the bag. Pipe a bow onto each cookie wreath. Let stand until set. Cherries and chocolate make a tangy-sweet pair. 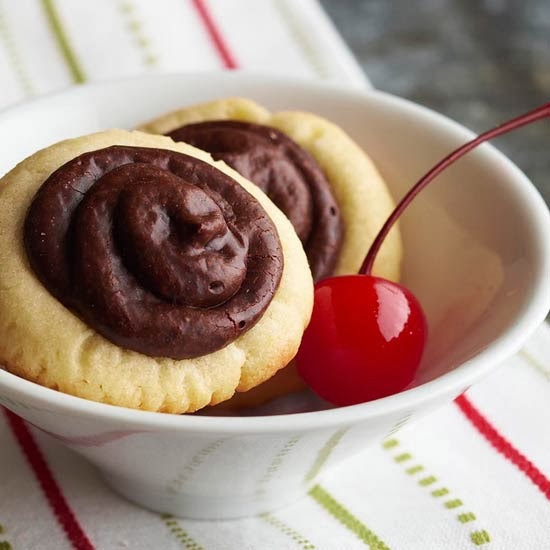 Include both in a classic Christmas cookie that gets its name from the cherry hidden in the center. Preheat oven to 350 degrees F. Drain cherries, reserving juice. Halve any large cherries. In a medium mixing bowl beat butter with an electric mixer on medium to high speed for 30 seconds. Add the sugar, baking powder, baking soda, and salt. Beat until combined, scraping sides of bowl occasionally. Beat in egg and vanilla until combined. Beat in cocoa powder and as much of the flour as you can with the mixer. Stir in any remaining flour. Shape dough into 1-inch balls. Place balls about 2 inches apart on an ungreased cookie sheet. Press your thumb into the center of each ball. Place a cherry in each center. For frosting, in a small saucepan combine chocolate pieces and sweetened condensed milk. Cook and stir over low heat until chocolate melts. Stir in 4 teaspoons reserved cherry juice. (If necessary, frosting may be thinned with additional cherry juice.) Spoon 1 teaspoon frosting over each cherry, spreading to cover. Bake for about 10 minutes or until edges are firm. Cool on cookie sheet 1 minute. Transfer to a wire rack and let cool. Roll your way to big-bellied Santa cookies complete with golden buttery goodness and decked-out decorations. Use our snow frosting for his fluffy white beard and cinnamon candies for his cherry red nose. A favorite of ours during the holidays, these Santa cookies are simply adorable. Press the balls of dough against each other as you flatten them, so they wont separate after baking. Preheat oven to 325 degrees F. In a large mixing bowl beat butter with an electric mixer on medium to high speed for 30 seconds. Add sugar. Beat until combined, scraping bowl occasionally. Beat in milk and vanilla until combined. Beat in as much of the flour as you can with the mixer. Stir in any remaining flour. Remove 1 cup of the dough. Tint the remaining dough with red food coloring. 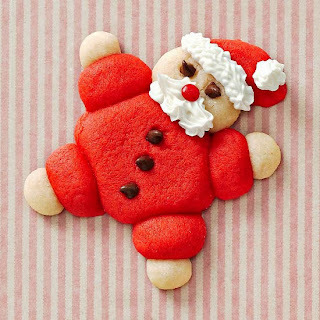 For each cookie, shape red dough into one 1-inch ball and five 1/2-inch balls. Shape plain dough into one 3/4-inch ball and four 1/4-inch balls. Place the red 1-inch ball on an ungreased cookie sheet; flatten until 1/2 inch thick. Attach the plain 3/4-inch ball for head; flatten until 1/2 inch thick. Attach four of the red 1/2-inch balls for arms and legs; attach the plain 1/4-inch balls for hands and feet. Shape and attach the remaining red 1/2-inch ball for a hat. Repeat with remaining dough, placing cookies 2 inches apart. Add chocolate pieces for eyes and buttons. Bake for 12 to 15 minutes or until edges are lightly browned. Cool on cookie sheet for 2 minutes. Carefully transfer to a wire rack; cool. Decorate cookies with Snow Frosting as desired. Attach cinnamon candies with small dabs of frosting for noses. Let stand until frosting is set. In a small mixing bowl beat shortening and vanilla with an electric mixer on medium speed for 30 seconds. Gradually beat in 1-1/3 cups of the powdered sugar until smooth. Beat in 1 tablespoon of the milk. Gradually beat in the remaining powdered sugar and enough milk to make frosting a piping consistency. Tint frosting as desired with food coloring.